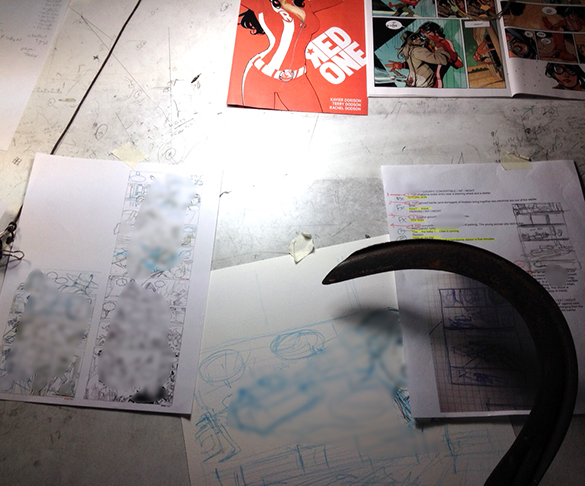 Working away on Red One Book 2 (issue 3 and 4) right now. 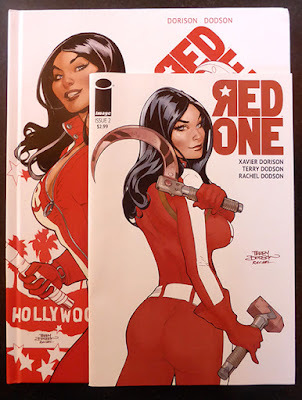 On schedule to ship Spring 2016 from IMAGE Comics. 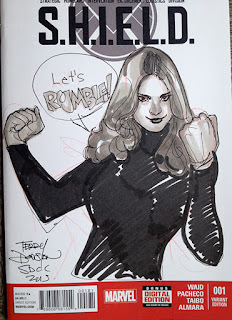 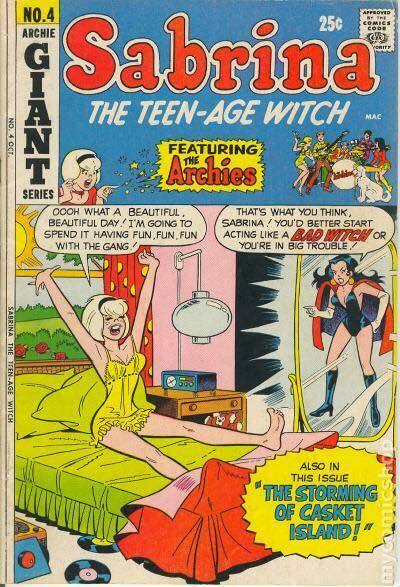 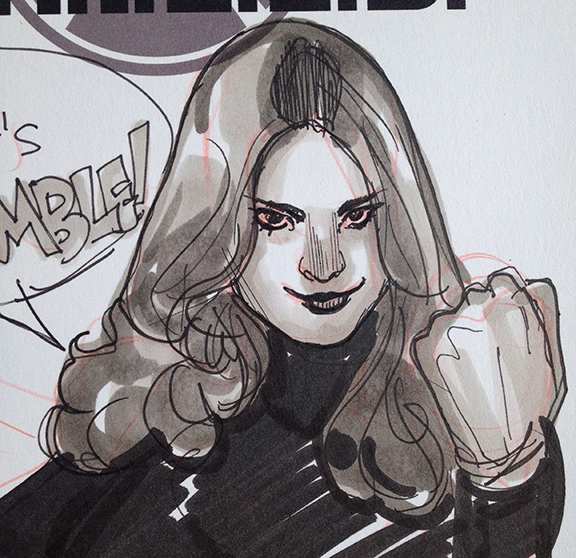 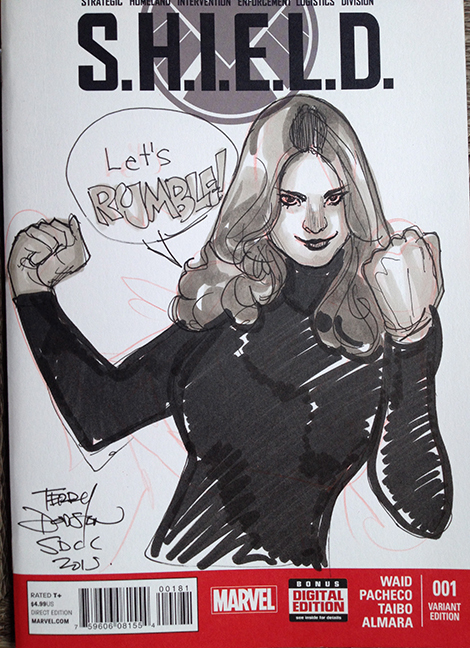 This is the recreation of an actual Sabrina cover I did at San Diego Comic Con July 2015. 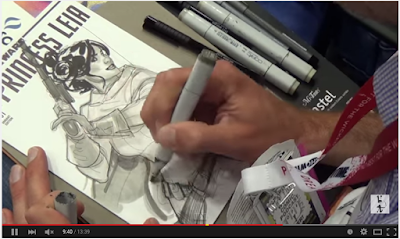 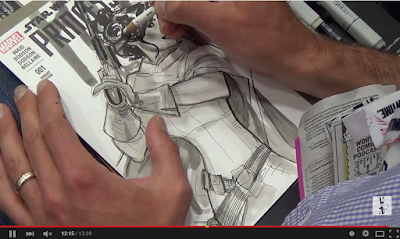 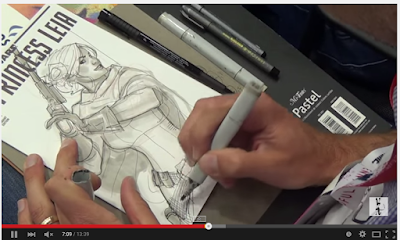 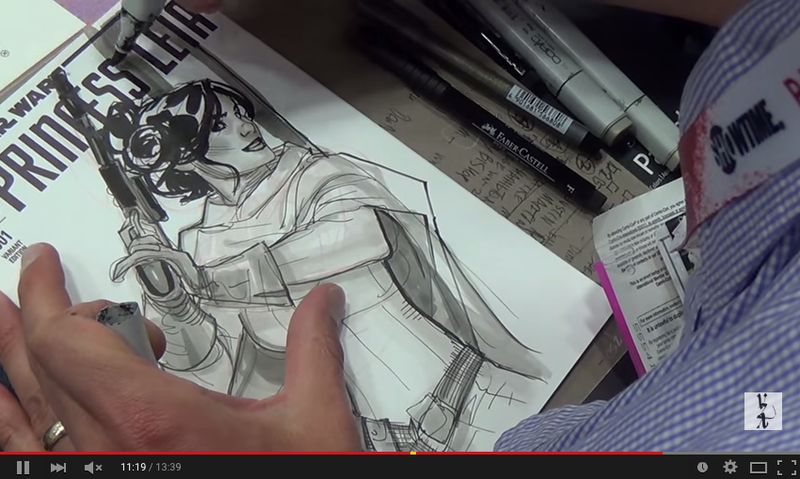 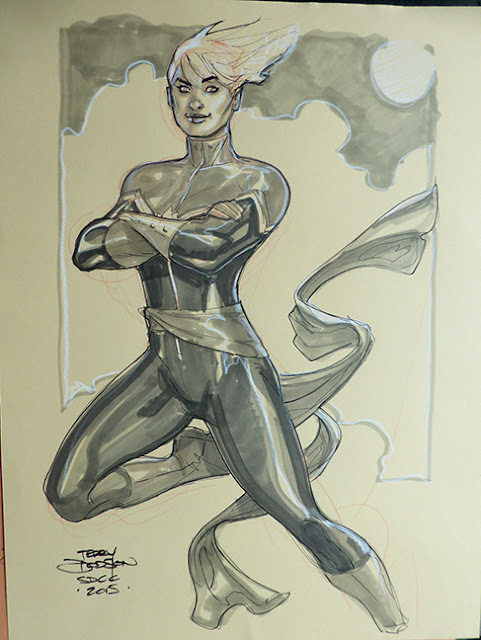 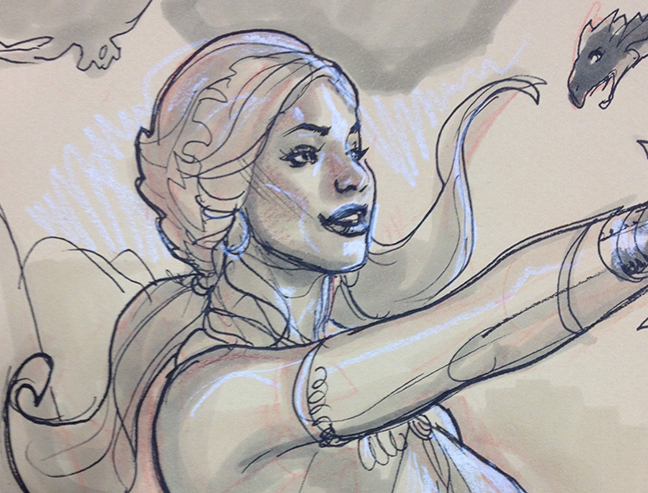 See how I turned this drawing into a full rendered Copic Marker drawing live at my booth at San Diego Comic Con 2015! 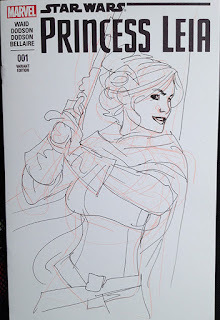 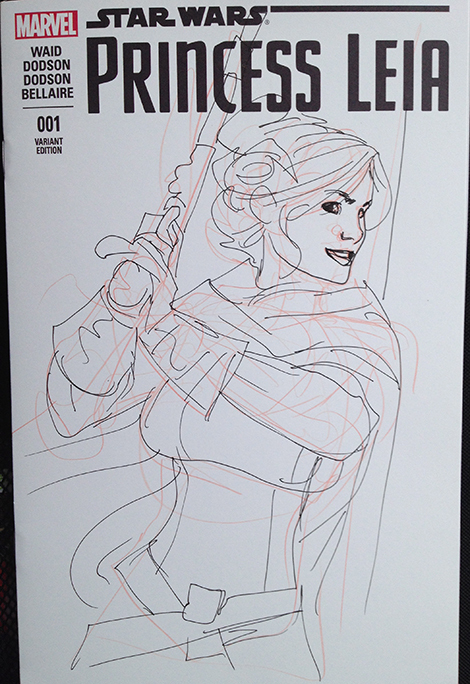 Rough in with Col Erase Scarlet Red and Pigma 01 Micron Pen on a Blank Star Wars Princess Leia #1 Cover. From here, I had the rest of the sketching filmed (didn't know beforehand, I simply roughed in the Leia before I came into the show for the day to work on during the show as commission-ee (Demian, my website honcho, actually) was leaving at 3pm that day). 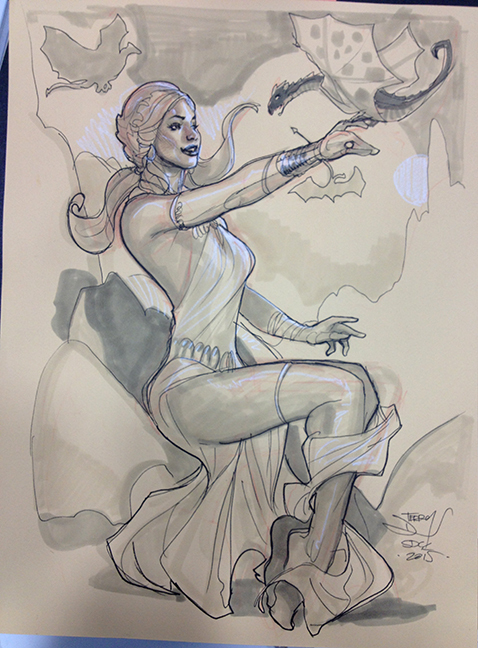 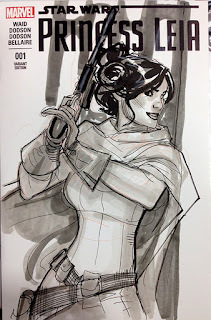 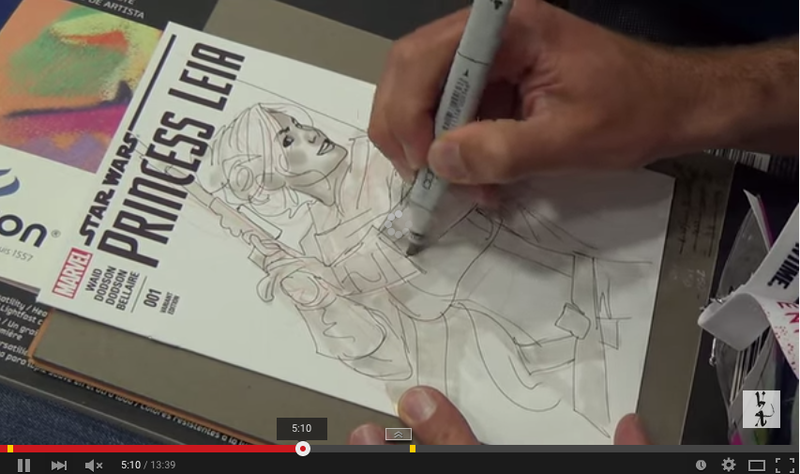 Leia from San Diego Comic Con 2015! 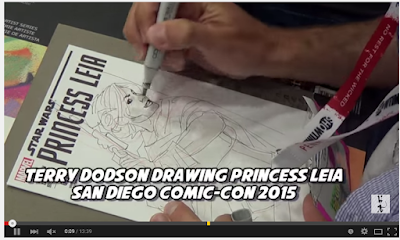 I was filmed while drawing so will post up details when it's available to view. 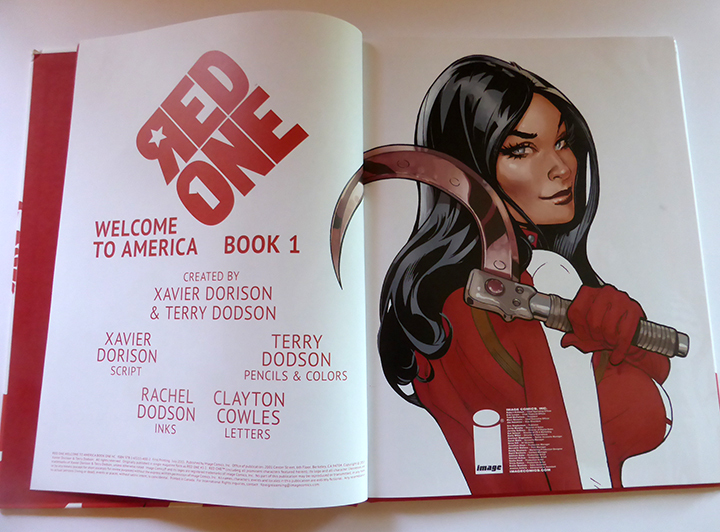 RED ONE Book 1 is now out - take a look at how we created the cover starting at the beginning. Tweaked Vera's face a litttle more - happy now! 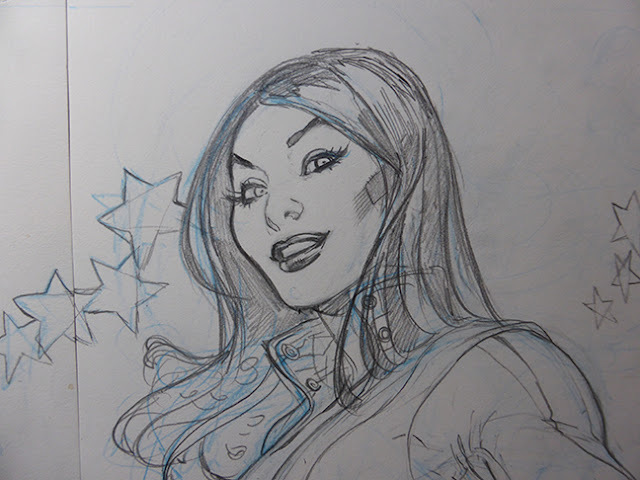 I picture Vera's hair as the straighter center parted hair - 74-75 hair - while most of the girls in LA in 1977 will be heading toward "Farrah" hair. 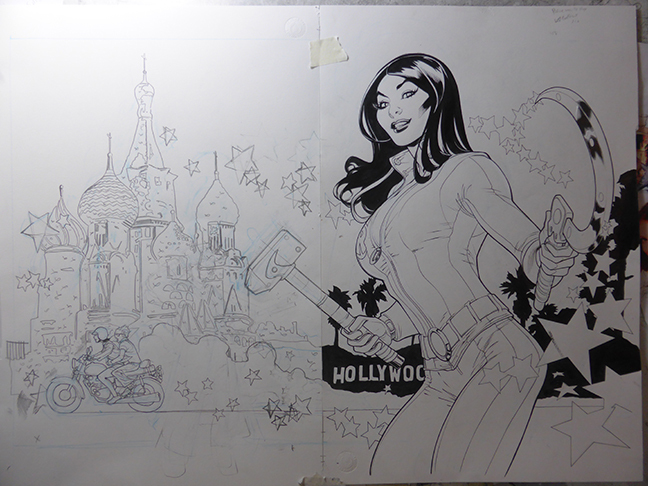 I gave Rachel the front cover to ink while I finished the backcover ... c'est la vie! Rachel "IX-NAYED" the little Soviet Vera figure on the back cover so I just added more smoke from Lou and Alabama's moto. 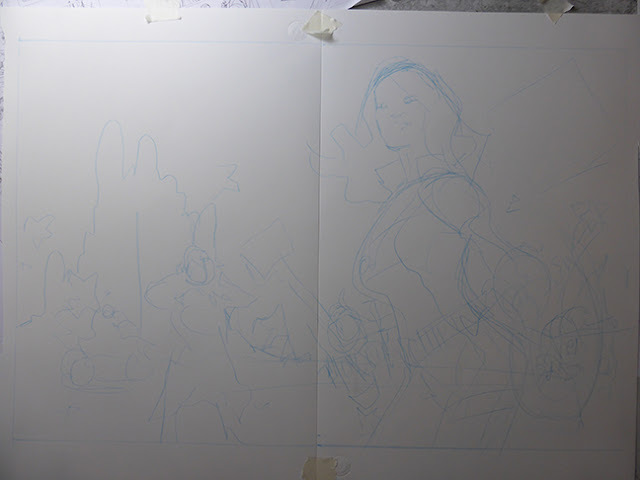 I had the wraparound image with the large Vera figure in my head for a LONG LONG time. This was the last paper sketch I did in April 2015. 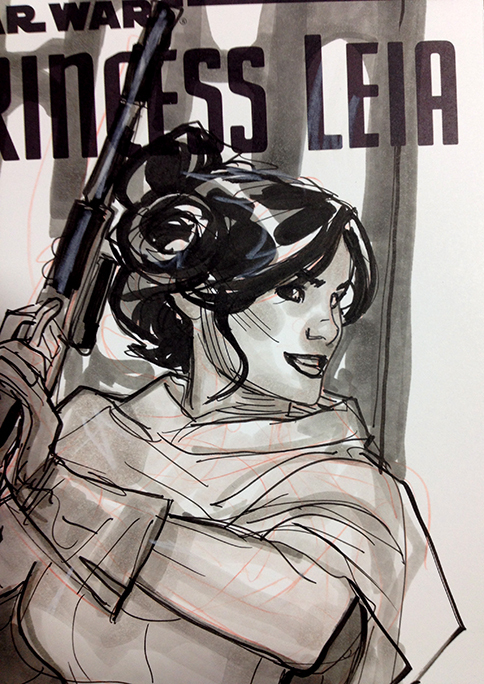 Once I sent issue 5 of Princess Leia out the door, I started to work on the final cover at the end of May 2015. Since there were so many elements I worked out a full size rough digitally and of course I had to make a wraparound Hardcover template for myself. 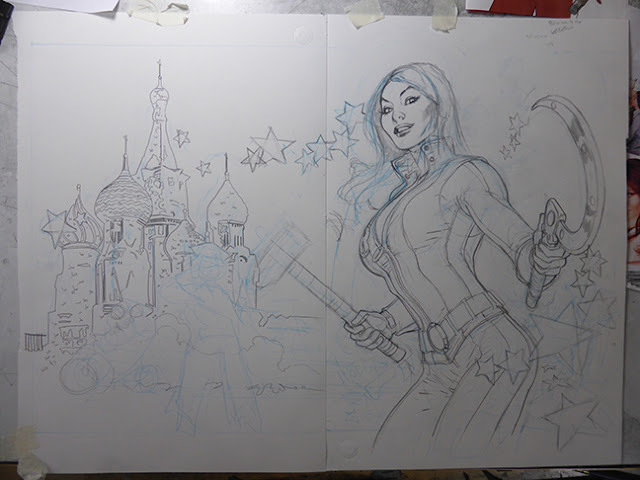 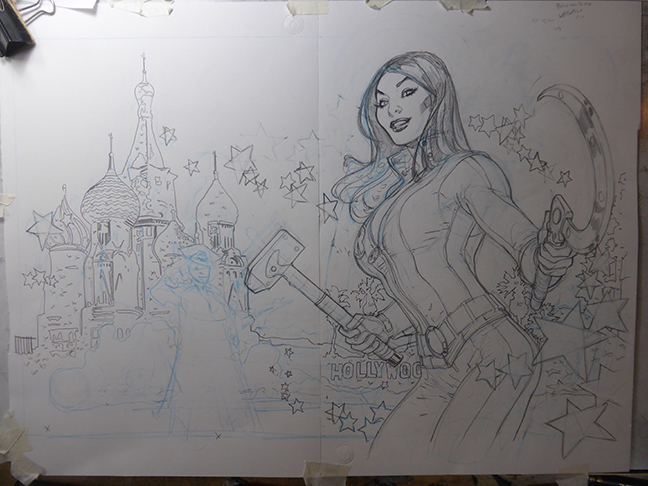 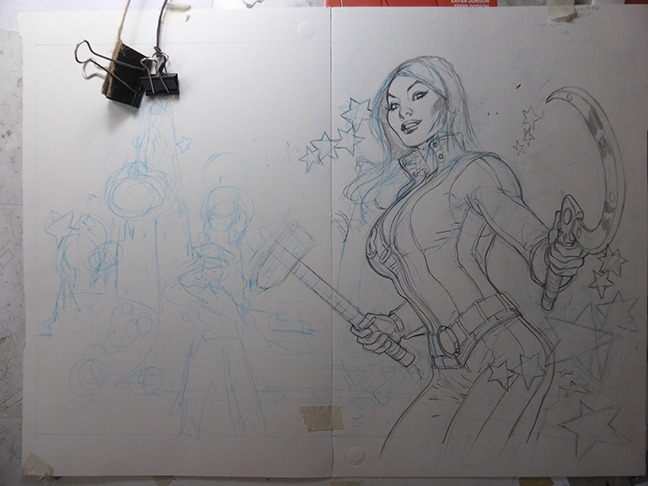 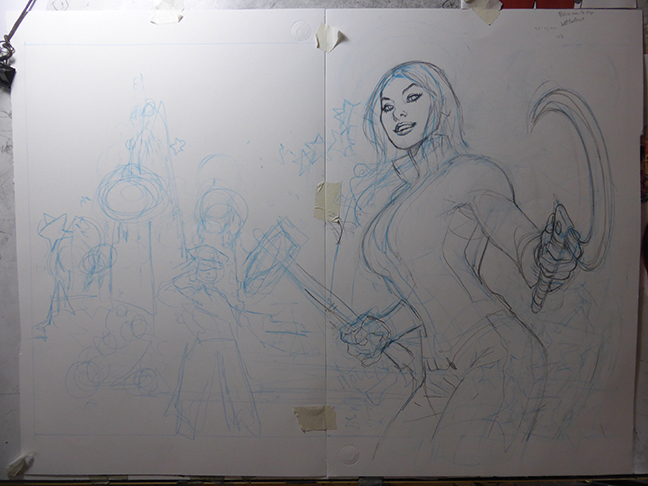 On to the cover - I taped together two 12 x 18 Bristol Boards to make a nice big cover! I started by roughing in the cover with a Col Erase Light Blue Pencil. 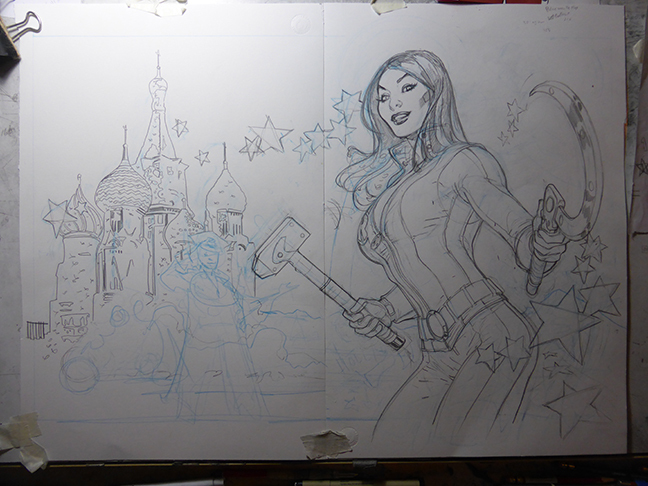 Started nailing down the figure and determining the correct location for the hammer and sickle. Switched to an HB lead pencil to begin finishes. 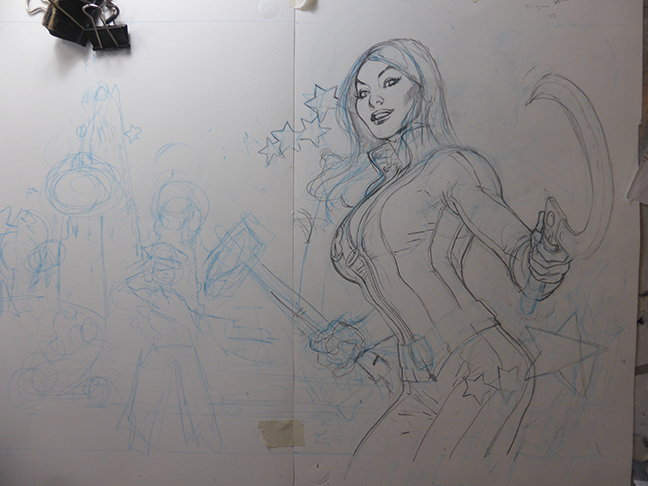 Ended up having the sickle go up in order to point back at Vera and the logo! Refining figure - pretty happy at this point. 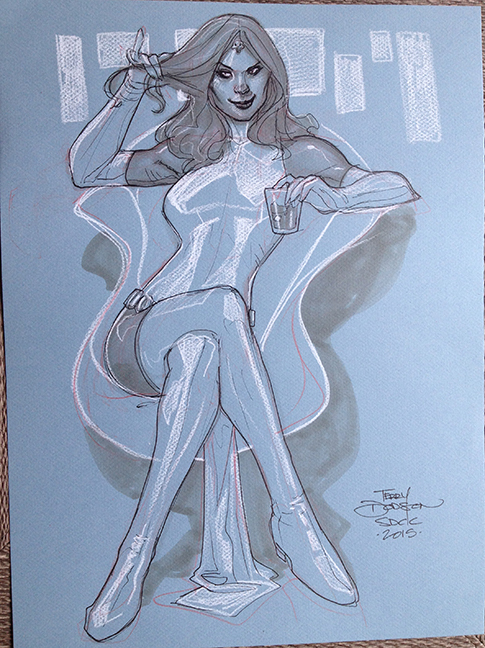 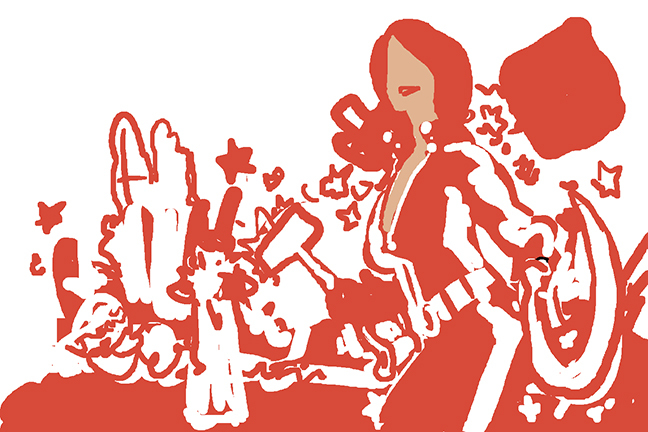 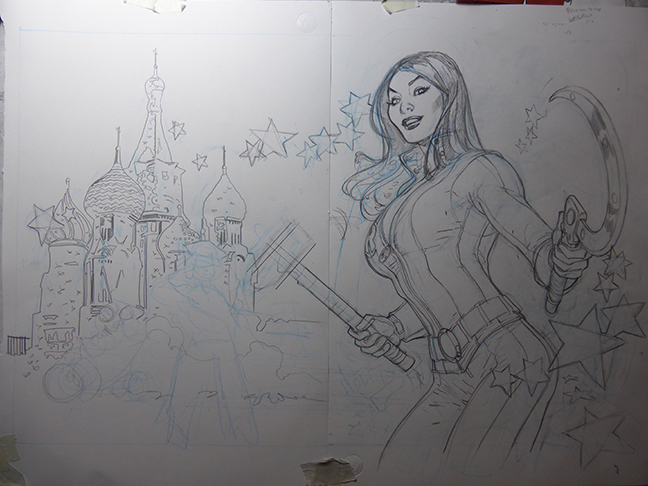 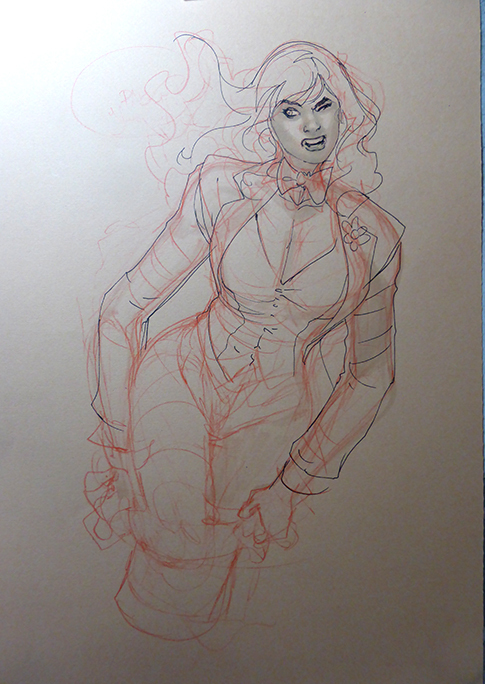 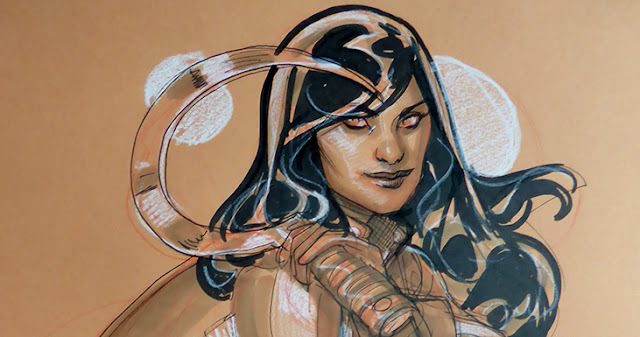 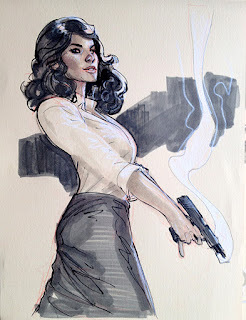 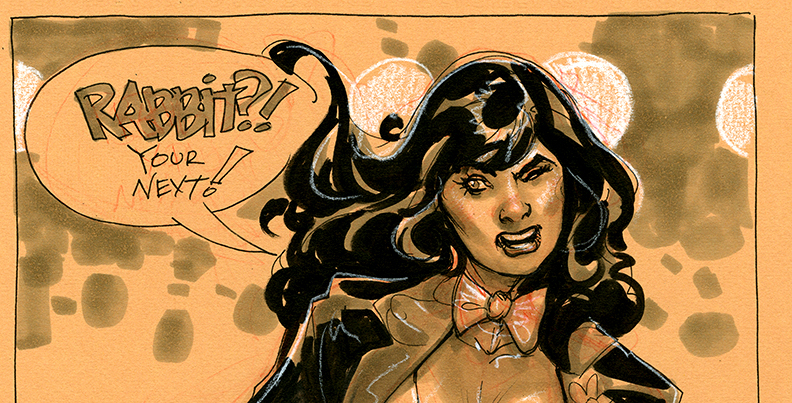 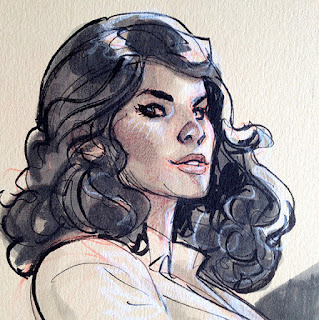 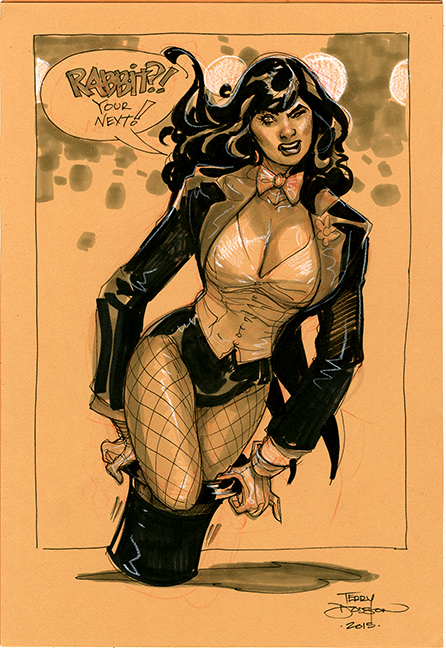 Hmmm- another Zatanna sketch - what to do, what to do, what to do... and I pullled another one out of the hat! 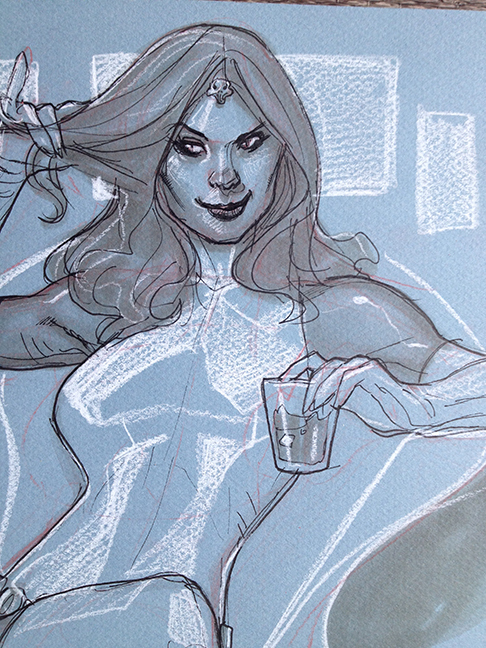 Finish up the drawing Pitt Pens S, F and B Black Pen, Copic Warm Grey , 3, 4, 6, 8 and White Prismacolor Pencil. 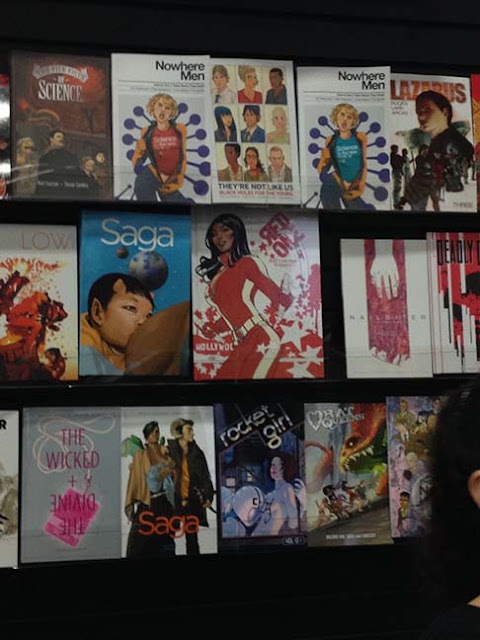 It was great to see RED ONE alongside all the other books at the IMAGE Booth at Comic Con! 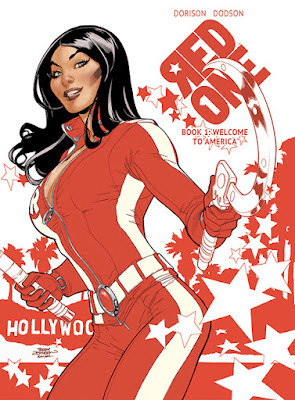 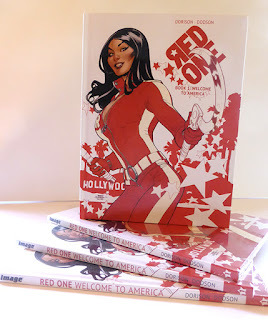 So RED ONE Book 1: Welcome to America debuted at the San Diego Comic Con last week and on it's available everywhere now! 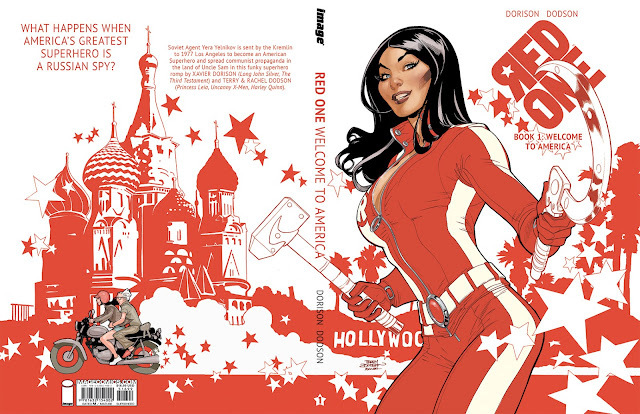 It's the 80 page collection of Xavier Dorison and my story of everyone's favorite Soviet Agent Vera Yelnikov as she goes on a undercover mission to 1977 Los Angeles. 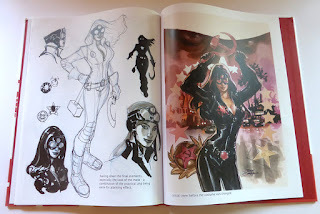 The book features the 59 page story plus 16 pages of bonus material all wrapped in a oversized European style Hardcover. 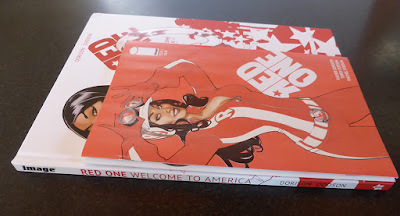 You can how see much bigger the 9.5" x 12.5" Book is compared to the Comic Book. Here's a good look at the spine for the thickness. 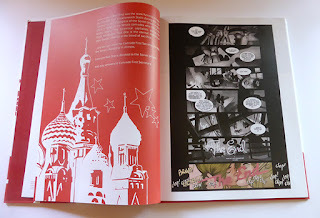 Based 1 to 1 on the European Bande Dessinee style of comic books that I love! The Book has been completed redesigned and the printing turned out great! 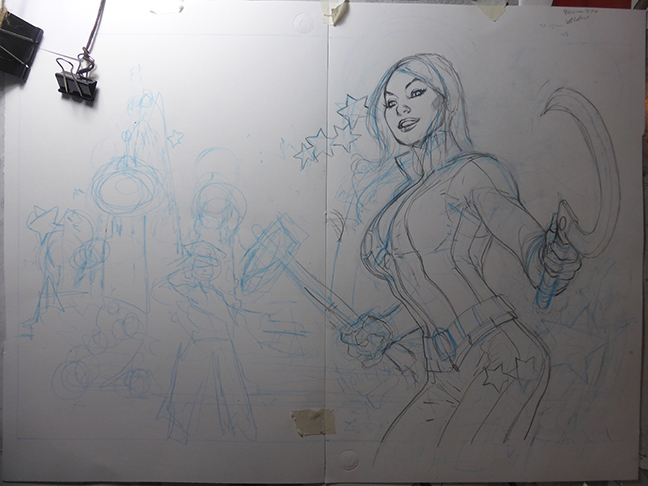 Another look at how well the art fills out these pages. Here's a look at the bonus material. 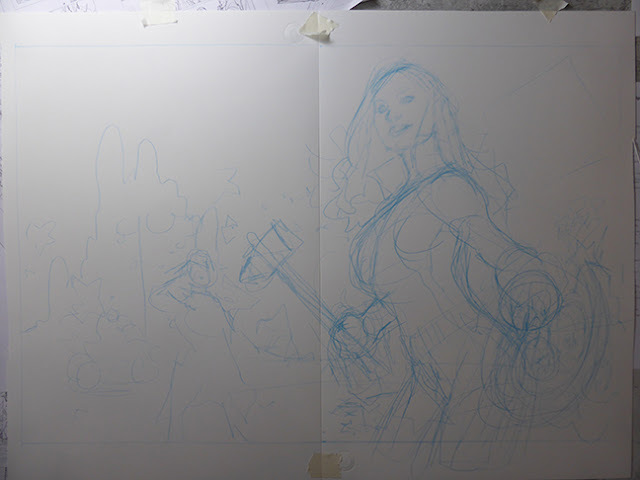 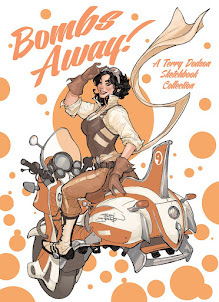 The Book has 16 pages of bonus material including character designs, unused covers, the covers sans lettering, a close look at pencils and inks of the pages plus a look at the making of all new wraparound cover.